Dragon Quest Builders, Square Enix’s new block making RPG feels like a rebellious child—not wanting to acknowledge its heritage, even though it’s really obvious. I got a chance for some hands-on time at this year’s TGS. Asked about the game, a representative told me that the game was inspired by “other such popular open world building games” but seemed rather hesitant to say the word “Minecraft,” and while the game definitely looks prettier than Minecraft, from what I experienced, it still has a bit of a ways to go before it reaches the same level of an open world. You have both your Minecraft-esque inventory bar, and aside from that, there is an equipment queue that you can stick multiple different weapons or tools to and by pressing the up/down buttons on the D-pad, you can cycle through them. Some items are for digging and others are for combat. The hammer, as seen in the game’s trailer, is your main digging tool. As is my nature to do, the moment I got my hands on the game, the very first thing I attempted to do was test its limits/break it. But trying to figure out how to dig took a moment of fiddling around. Simply hitting the dig/attack button (square) will only hit things on the same horizontal plane as you. To aim above and below, as was pointed out to me after a minute or so of frustration, you need to press the L1 or R1 buttons. Pressing the shoulder buttons will allow you to aim for and hit blocks or enemies one level above or below you. With that knowledge, it was time for the dig. The dig ended pretty quickly. I could only dig down about three or four levels down into the earth before I hit an invisible barrier that prevented me from digging further. Somewhat disappointed, I tried the reverse and started building a Stairway to Heaven (cue guitar). Unfortunately, that only went up maybe 40 or so levels before it wouldn’t let me build any higher (frowny face). Despite the vertical limitations, the game does have other unique elements going for it. The overall aesthetic and look is charming as hell. The movement and action is smooth as butter. Also, the game incorporates a schematic system that teaches you how to build basic things so the game isn’t so daunting for the uninitiated. In my short time with the game, one thing it seemed in desperate need of was a first-person mode. As far as I could tell—and I fiddled around with the controls quite a bit—the game in its current form is only in third person. This makes knowing exactly what you’re aiming at a little difficult and also turns entering small closed-off spaces a little wonky. I can only imagine what it’s like when you dig tiny one-man tunnels. The game will have a specific story mode and a campaign objective, although how one plays and what they do is entirely free. Even after the final boss is defeated, players can continue to explore, dig, and build to their heart’s content. The game will also include a free mode where players can faff about without worrying about health or hunger and will be able to share creations online. Dragon Quest Builders is overall quite adorable and fuzzy, but feels like it needs more to make it its own thing and not a proto-Minecraft with Dragon Quest elements. That and a PC version, perhaps. 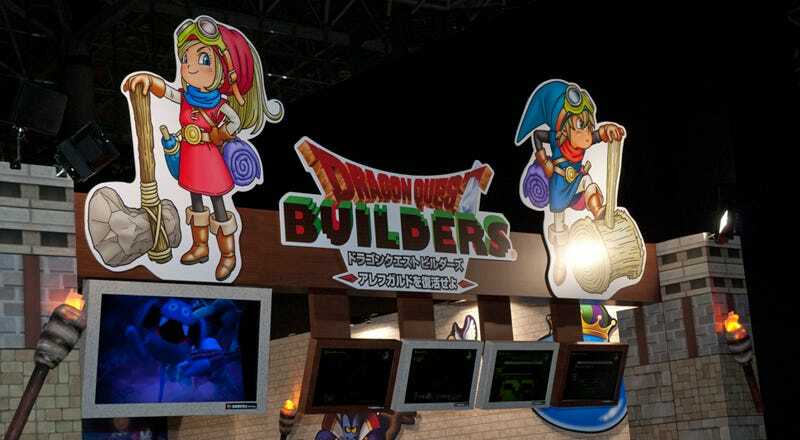 Dragon Quest Builders is scheduled for release in Japan on the PS4, PS3, and PS Vita on January 28th. No word on an international release.